It’s got 80 houses, a gym, basketball courts and everything else you’d need to make your very own community. A FORMER US Navy base has gone up for auction in West Virginia, and it could currently be yours for just over €1 million. Sugar Grove Station is located in Pandelton County, West Virginia. The Naval Operations Centre support base was decommissioned on 30 September 2015, after 60 years of operation. And now it’s gone up for auction – with the bidding currently at $1,000,000. 80 single family homes with carports – on ‘lovely’ tree-lined streets. A 3-storey, 45,424 square foot building which contains 53 small suites which can accommodate up to 105 residents, an industrial kitchen, a dining room, a laundry room, and several lounge areas. A massive public works building with maintenance offices and a gym. A community centre with a restaurant/bar. Lots of recreational amenities – like a playground, swimming and kiddie-pool with changing rooms, basketball, tennis, racquetball courts, running track, football/soccer field, baseball field and nearby fishing on the South Fork River. 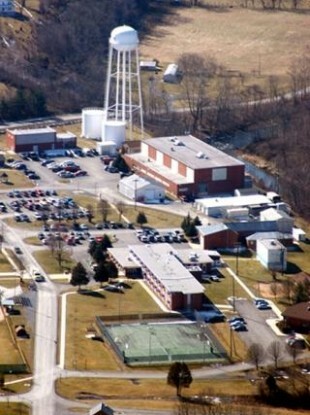 The WV Gazette Mail reports that the site, which ceased operating on 30 September, was potentially going to be a prison, the plans were shelved as the cost of converting the base would be too high. But for a self-sustainable community in rural West Virgina, you shold look no further than this bargain. Email “For $1 million this ex-US naval base could be yours”. Feedback on “For $1 million this ex-US naval base could be yours”.